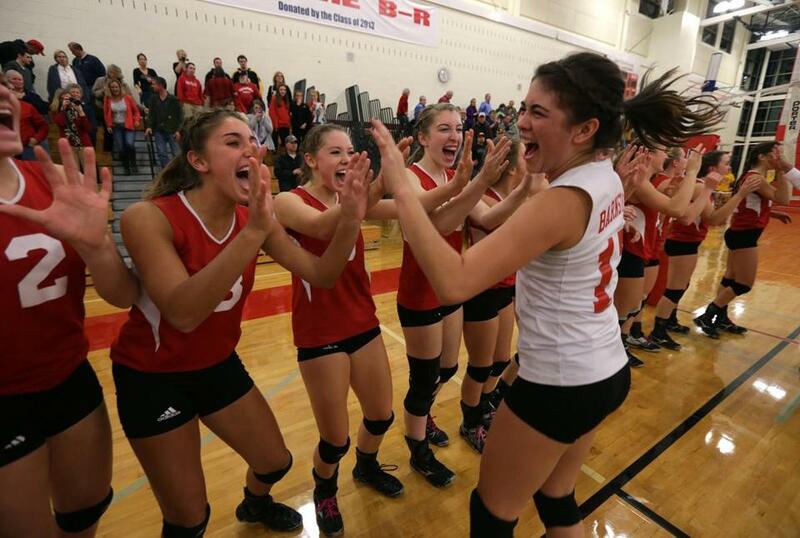 Division 1 Player of the Year Stephanie Martin (in white) went down the line, celebrating with her teammates after Barnstable beat Andover in the Division 1 state semifinals. The four-time Division 1 state champion anchored a 23-0 squad with 348 digs, 32 aces, and a 92.3 serve percentage. The MGVCA All-State player and Old Colony League All-Star played in the Bay State Games. The Bryant University commit anchored the Cougars’ first Division 2 state championship to finish her career with 735 kills, 495 digs, and 166 aces. The two-time All-State player played SMASH Volleyball for three years. Leidhold has compiled 688 kills, 152 aces, and 1,021 digs to date and earned a spot on the MGVCA All-State team this season. The South Coast Conference All-Star was also selected to the Under Armour Volleyball Factory National Team. The four-time Division 1 State champion tallied 268 kills, 258 digs, and 397 serve receptions this season. The MGVCA All-Star and National Honor Society member also plays softball. The junior captained the Green Dragons to the Division 2 South Sectional final, finishing with 105 aces and 160 kills. The honor roll student also captains the softball team and competes on the swim team. The Division 2 All-State player helped the Cougars earn their first state championship, finishing with 800 assists. The sophomore setter will be competing with the Southern Alliance Elite Program next season. The sole returning starter captained her defending Division 2 Central Sectional champion squad to the sectional final, capping a 19-3 season. Devoe had a career-high 30 kills in her final match. The senior also played SMASH Volleyball. The six-footer capped an 18-5 run to the Division 2 Central semifinals, totaling 292 kills, 74 digs, and 23 aces. The National Honor Society member is also a standout basketball player and will captain the team her senior year. The Division 1 All-Stater captained her squad to the Division 1 state semifinals. A National Honor Society member, Hu is enrolled in five Advanced Placement classes. She also competed with Latitude-42 in Nationals in Dallas. The Big Three and MGVCA All-Star led the Whalers to an 18-0 regular season, the third perfect campaign in school history and the Division 1 South Sectional final. She finished the season with 276 kills and a .313 hitting percentage. A member of the three-time state finalist Tigers, King also is a three-time Bay State All-Star and sectional title winner. She capped her career with a spot on the Division 1 All-State team. The two-time Catholic Central League co-MVP had 398 kills this season and helped the Crusaders reach the Division 2 State semifinals. Lipka also played Bay State volleyball and AAU for the Bay State Blizzard. The two-time Dual County League All-Star and this season’s league MVP helped get her Central-West Sectional champion squad to the Division 1 state semifinals. The two-year captain also has played with SMASH Volleyball. Quinn was named the EIL MVP for the second year in a row, helping Dana Hall finish first in the league. Quinn is also the president of the Best Buddies Club and one of two editors of the student newspaper. The Division 1 All-State player is a four-time Northeastern Conference All-Star and this season’s conference MVP after leading the Tanners to a 21-1 record. The National Honor Society member plays basketball and committed to Southern New Hampshire University. The Cape Ann League Player of the Year delivered 101 kills, 22 aces, 27 digs, and 35 blocks, helping the Pioneers reach the Division 3 State semifinals. The National Honor Society member also was an All-League and All-State selection. The seventh-year coach earned the program’s first Division 2 state championship and now has a 113-37 career record. The Springfield College alum commends his team for its passion and energy, carrying the slogan ‘‘One Team, One Dream.’’ Shepherd is also the program director of the Southern Alliance Mizuno SA Elite. Anticipating a rebuilding year, the Merrimack Valley Conference Coach of the Year’s team ‘‘proved me and the papers wrong,’’ said Sullivan of the squad’s 23-game win streak. The Golden Warriors’ season included a share of the MVC title and a North Sectional title. The first-year varsity coach piloted a 20-2 season for her South Coast Conference co-champions, saying she was ‘‘fortunate to start my varsity coaching career with a competitive and passionate group of girls.’’ The St. Anselm alum played volleyball, basketball, and lacrosse at West Springfield High School. Bay State — Braintree: Nora Donahue, Bridget Herlihy, Ashley Russell. Brookline: Brooke Gibbons, Nica Kovalcik, Lisa Tarasyuk. Milton: Allison Grassa. Natick: Kerry Getchonis, Robin McElaney, Natalie Palmer. Newton North: Micaela Cohen, Alana King, Infiniti Thomas-Waheed. Norwood: Amanda Springer. Walpole: Summer King, Morgan McLenan. Wellesley: Susannah Phillips, Elizabeth Webb. Big Three — Brockton: Patti Landerholm, Dulcelina Miranda. Durfee: Amber Nelson. New Bedford: Caleigh Davis, Sydney Fournier, Sydney Harris, Alyssa Kellick. Boston City — Boston English: Jasmine Allen, Heidy Barreiro, Idil Barros. Boston International: Ivany Gomes, Bradley Sanchez-Carmo. Brighton: Reyna Joint, Guerlandy LaGuerre, Kiara Pandy. Burke: Medgine Joseph, Ariana Pina, Djany Pina Gomes. Charlestown: Joselyn Leiva Joaquin, Emma Sandlykke. CASH: Mariamma Bah, Gabriela Caruffo. Dorchester: Nalitza Valentin, Tanaizha Willis. East Boston: Natalia Preciaso, Clarita Prudencio, Ava Salvi. Latin Academy: Victoria Thong, Alexandra Wilson, Christina Wong. Madison Park: Antonea Green, Rebecca Mondesir. O’Bryant: Bonnie Li, Nancy Liu, Camly Pham. Snowden: Elaine Chen, Emily Chen, Manouska Jean. South Boston: Jose Berthe Honore, Sarah Padgett, Elaina Wright McCarth. West Roxbury: Yarielis Ortiz, Melissa Pena, Viarlis Romero. Cape Ann — Hamilton-Wenham: Maddie O’Connor. Lynnfield: Kelly Corcoran, Emma Mancini, Ashley McRae, Hannah Shaievitz. Masconomet: Kate Barry, Haley Geenslade, Maddie Kelly, Natasha Murray. North Reading: Johanna Lesch, Emily Murray. Peabody: Carolyn Scacchi. Saugus: Norma Waggett. Catholic Central — Bishop Fenwick: Kaitlyn Lipka. Cathedral: Jennifer Mai. Cristo Rey: Christine Williams. Lowell Catholic: Julia Bodoni, Liz Friedrich, Megan Sheppard. Marian: Jeanine Duchaney, Alicia Franchi, Leana Mohr, Kiahna Moore, Zaria Powell. Pope John: Abby Cain, Dianna Grajales, Amanda Reis, Eleny Rossi. Pope John Paul II: Savannah Carey, Katherine Conway, Alana Cotto. St. Clement: Jessica Popken. St. Joseph’s Prep: Nora Pance. Catholic Conference — Fontbonne: Madison Devine, Caroline Shea. Notre Dame (Hingham): Corinne Cox, Julia Flynn, Julia Marshall. Ursuline: Julia Golyette, Jenny Weston. Commonwealth — Chelsea: Marina Melendez, Rebeca Torrento. Fellowship Christian: LeighAnne Trepanier. Greater Lawrence: Lisbeth Rodriquez, Ivonne Ruiz. Greater Lowell: Laurie Golas, Taylor Sweeney. Lynn Tech: Yerania Castro, Yarmireshka Fratichelli. North Shore: Isabel Camacho, Sabrina Napoli. Northeast: Jazmine Escobar, Arianna Veneziano. Notre Dame (Tyngsborough): Jordan Blazak, Cathryn MacGregor, Colleen Martin, Tanusha Yarlagadda. Presentation of Mary: Victoria Calcagono, Samantha Fox, Amari Spears. Shawsheen: Danielle Cacciolla, Emily Cnoops. Whittier: Makaykla Hardy, Dominique Ortiz, Chantel Riendeau. Dual County — Acton-Boxborough: Emily Ropiak. Bedford: Colleen Smith, Sophie Zacharakis. Boston Latin: Emerson Boone, Maggie Mulligan, Erica Szulc. Concord-Carlisle: Ellie Blue, Margaret O’Brien. Lincoln-Sudbury: Jennifer Ayer, Aimee DeArias, Dara Storer. Newton South: Izzy Shishko, Julia Smith. Waltham: Kushi Singh. Wayland: Teresa Whitesell. Westford: Lauren Katz. Weston: Gabriella Ardilla, Paige Gordon, Kacie Wien. Eastern Athletic — Bishop Feehan: Victoria Anderson, Darby Barrett, Ann Kaczowka, Kiley O’Donnell. Bishop Stang: Courtney Carroll, Hannah Carvalho, Natalie Spaodone. Coyle & Cassidy: Lindsay Bumila. Somerset Berkley: Amanda Holewiak. EIL — Bancroft: Nicole Moheghagh, Kathryn Shaffert. Beaver Country Day: Arielle Silbersweig. Concord Academy: Alex Craig, Corey Rost. Dana Hall: Elena Heiland, Margot Palandjian, Claire Quinn, Jodie Sheffels. Newton Country Day: Sally Lakis, Nicole Macedo, Amy Monasterio. Pingree: Casey Torto. Greater Boston — Cambridge: Yanthia DeJesus, Nathielly DeOliveira, Autumn Harrison, Meron Woldemariam, Myeisha Worrell. Everett: Joana Sartor. Malden: Diamond Jones, Kierra Sexton. Medford: Clare Doncaster, Ashley Eisnor, Kelly Foley, Amy Lam. Somerville: Hebron Abadi, Leslie Duarte, Brooke Metivier. Hockomock — Canton: Avery Devoe, Elizabeth Hamilton, Erin Proctor. Franklin: Lauren Irvine, Dayna McCue. King Philip: Melissa Daigle, Ellery Lyons, Brigid Murray. Mansfield: Lauren Beecher, Eliana Casamassima. Milford: Giovanna Arcudi. North Attleborough: Annika Briggs, Alison McHugh. Oliver Ames: Michaela Lievi. Sharon: Mimi Ross. Stoughton: Kayla Motley. Taunton: Aimee Kitsner. ISL — BB&N: Gaby Gayley, Amanda Lifford, Lydia Zaleski. Governor’s Academy: Courtney Cashman. Milton Academy: Marian Fleites, Jamie Murray. Nobles: Amy Duggan. Mayflower — Avon: Shannon Sinclair. Bishop Connolly: Krystal Andrade, Maura Fennessey. Blue Hills: Brittany Clark, Shea Sullivan. Bristol Aggie: Shandell Saylors. Bristol-Plymouth: Rachel Ducharme, Courtney Mosher, Carley Mulcahy, Sami Mulcahy. Cape Cod Tech: Kelci Brouwer. Diman: Brynn Pasternak. Holbrook: Elizabeth Kerek, Cailey Kerr. Norfolk Aggie: Brenna Burke, Ashley Gatchell, Sam LeBlanc, Courtney Murray. Old Colony: MacKenzie DeTerra, Ryan Stopka. Sacred Heart: Courtney Burt, Katie Foley, Lauren Melchionda. South Shore Voc-Tech: Kayley McKenney, Olivia O’Connell. Southeastern: Emily MacDonald. Tri-County: Lauren Hall. Upper Cape: Rebecca Wolfe. Westport: Jen Alves. Merrimack Valley — Andover: Azita Bakhtyari, Chelsea Hu, Rachel Schnakenberg. Central Catholic: Kaleigh Smith, Amanda Williams. Chelmsford: Michelle Jaquint, Cassidy Tyros. Haverhill: Ornela Llupo, Abigail Sonuga. Methuen: Alicia Miller. North Andover: Erin Cox, Merry Eagan, Rachel Karpinski. Middlesex -- Belmont: Annie Hang. Burlington: Melanie Aquino, Becca Ellis, Maya Russell. Lexington: Olivia Goddard, Muriel Lavallee, Nikita Selivan. Melrose: Annalisa DeBari, Meri Lessing, Jill MacInnes, Allie Nolan. Reading: Sarah Haase, Casey Hopkinson. Stoneham: Olivia Gaughan, Emily Trant. Winchester: Sara Fontana, Lakshmi Ilango, Rachel Smith. Woburn: Nicole Rice. NEPSAC - Choate: Ami Coulibaly, Elizabeth King. Loomis Chaffee: Greer Davis, Alison Yeh. Northfield Mt. Hermon: Erica Freed, Erin Moore. Phillips Andover: Alex Becker, Nette Bell, Kate Wincek. Phillips Exeter: Brooke Detwiler, Taylor Jean-Jacques. St. Paul’s: Alie Rusher, Brighton Troha. Old Colony — Barnstable: Hannah Andres, Olivia Brodt, Ciara Bruning, Nicole Derosier, Colleen Kenney, Stephanie Martin, Madison Sollows, Holly Wilson. Dartmouth: Steph Bullard, Marissa Mota, Bailey Peach, Marissa Rocha. Patriot — Duxbury: Mackenzie Bright, Samantha Chaisson, Kelly Dame, Molly Quilty. Hanover: Britton Lastowka. Hingham: Maggie Finney, Katherine Saleski. Middleborough: Kim Besse. North Quincy: Nancy Huang, Carolyn Schwartz, Maya Umoren. Pembroke: Tamara Mitchell. Quincy: Nicole Jorgensen, Emma Kelly, Courtney Ryan. South Coast — Apponequet: Amanda Lacroix. Bourne: Colleen Brady, Shelby Corsano, Chelsea Doucette. Case: Erin Abdallah, Jenna Santerre, Samantha Travis. Fairhaven: Courtney Girouard, Katie Leidhold, Courtney Tavares. Greater New Bedford: Melanie Diaz. Seekonk: Kayla Baril. Tri-Valley — Ashland: Jess Miller. Holliston: Kathryn Hunter. Hopkinton: Holly Adams, Renee Cooprider, Hanna Engstrom. Medfield: Caroline Beck, Kristin Fechtelkotter, Anna Krah, Lizzie Taylor. Medway: Caitrin Foley, Phoebe Rorke. Millis: Mia Burruss. Norton: Jackie Dunne. Westwood: Madeline Stuart.